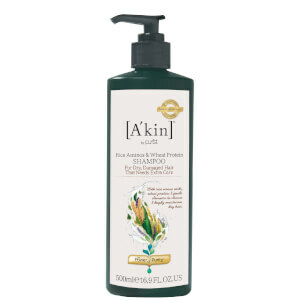 Treat dry, damaged hair to the benefits of A'kin's Rice Aminos and Wheat Protein Shampoo; a deeply nourishing formula that works to restore healthy-looking locks from root to tip. Harnessing the powers of Rice Amino Acids, Wheat Proteins and six botanical cleansers, the lightweight shampoo gently eliminates impurities, whilst delivering intense moisture to parched strands. Expect smooth, frizz-free locks with enhanced shine. Massage a small amount into wet hair and scalp. Rinse and reapply if necessary. Aqua (Water), Sodium Lauroyl Sarcosinate, Disodium Cocoamphodiacetate, Cocamidopropyl Hydroxysultaine, Sodium Lauryl Sulfoacetate, Lauryl Glucoside, Sodium Chloride, Glycerin, Sorbitol, Coco-Glucoside, Glyceryl Oleate, Glyceryl Laurate, Panthenol, Citric Acid, Sodium Citrate, Sodium Cocoyl Glutamate, Sodium Gluconate, Guar Hydroxypropyltrimonium Chloride, Hydrolyzed Wheat Protein, Sodium Hydroxymethylglycinate, Rice Amino Acids, Tocopheryl Acetate, Lavandula Angustifolia (Lavender) Oil, Citrus Aurantium Bergamia (Bergamot) Fruit Oil, Citrus Aurantium Dulcis (Orange) Peel Oil, Quillaja Saponaria Bark Extract, Tetrasodium EDTA, Jasminum Officinale (Jasmine) Oil, Limonene, Linalool.